It’s so fun to watch children build confidence when they are learning their shapes. Everywhere that they go, they notice shapes. Rectangles on the bricks of houses, squares on the sidewalk, triangles on the pizza… Talking about it can be a real time-filler! Great for passing the time on car rides or waiting in a doctor’s office. 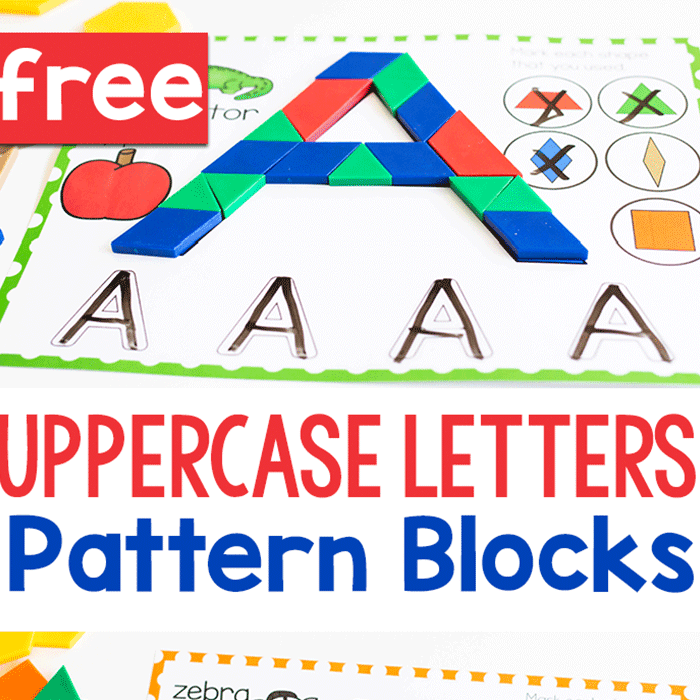 My three older girls are pretty skilled when it comes to shapes, but I wanted to have some activities on hand for when Shiloh is ready to start learning about them. Plus, I wanted something that could give Jaida confidence in reading and learning. Jaida is a perfectionist to the core. So it is very beneficial to use things that she has mastered when helping her to learn something new. 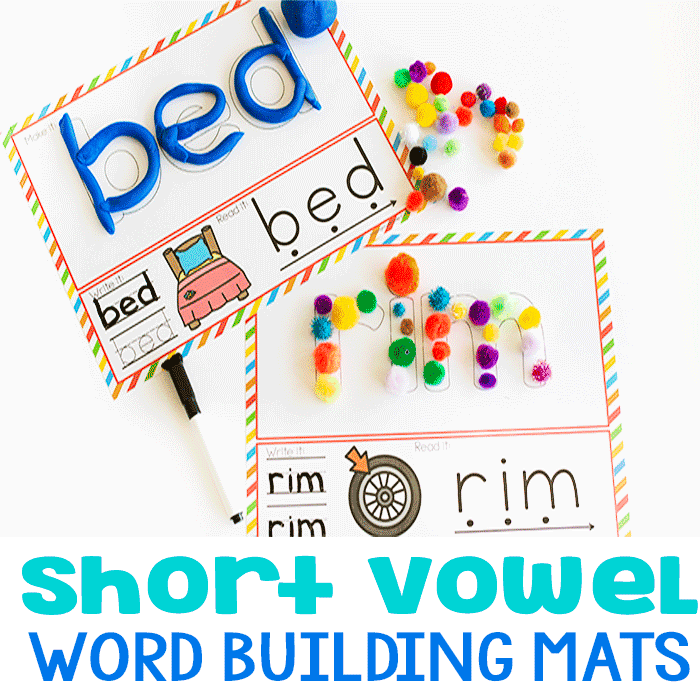 So in a couple of these activities I combined what she knows, basic shapes, with things that she needs practice with, reading sight words. One of the activities that I made for her was a flip book. Did you ever have one of those monster books as a child? The ones with the three sections and you could mix-n-match the different body parts to create something totally crazy? This flip book is sort of similar. I purposefully did not match up the shapes and their ‘real-life’ counterpart, so that Jaida would need to find the correct pictures giving a chance for higher thinking while still feeling like she had the skill mastered. 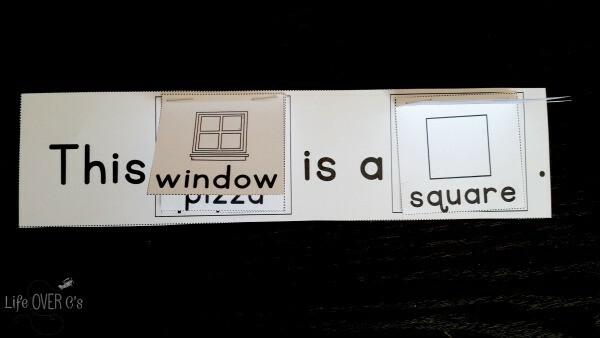 After she matched up the sentences correctly, we took the flip book into the living room and used our magnetic white board to create some sentences with the word cards that I created. I printed out the cards, laminated them and then use a strip of magnet tape to add magnets to the backs of the cards. 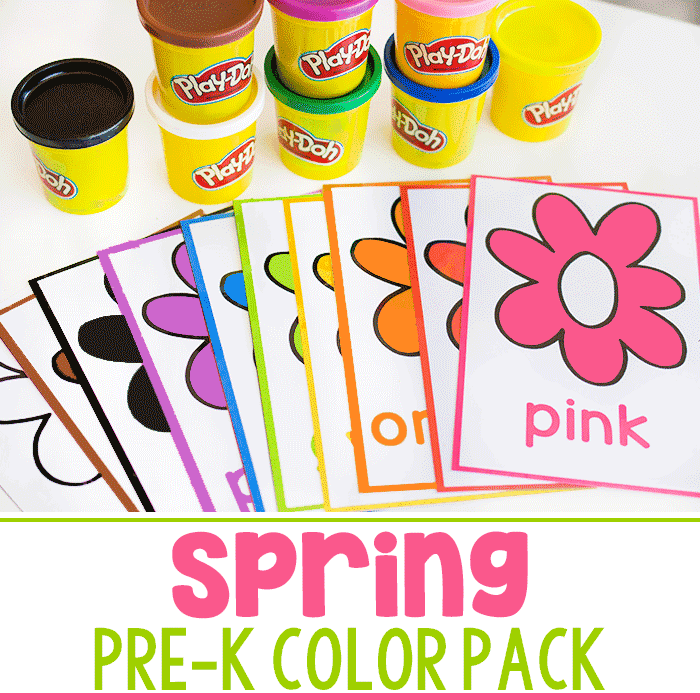 You could also use the laminated cards on a sticky wall, table, or in a pocket chart. I placed the cards onto the magnet board and then we worked together to create some sentences. I chose the traditional shape and she chose the matching “real-life” shapes. Then she read the sentences out loud. You may notice that I have the word ‘blue’ on the board. I realized that I was missing ‘an’ as we were using the activity, so I removed the word ‘blue’ and replaced it with ‘an’. We didn’t stop there though, we continued our learning with a little bit of fun using a Spin & Cover game for shapes. I love to laminate, so I laminated the board. However, it would work just as well without laminating. It would just not be as durable. For the spinner you can hold a pencil in the center with a paper clip around the tip or you can create a more permanent spinner with a brad and a paper clip. There are several ways that you can use the game. You can use it as an individual activity. 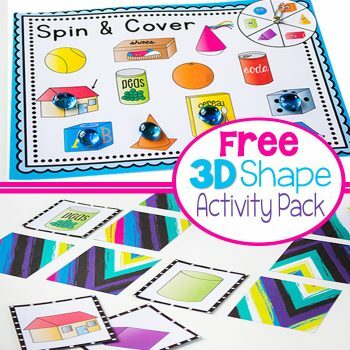 The student would spin and then cover up the shapes as they are spun. You can use it as a partner activity. The partners would take turns spinning and covering the shapes. The student with the most shapes covered wins. You can use it as a Bump! game. With two players, the concept is similar to a partner Spin & Cover, only you can bump! your partner’s markers off the game board if you spin the same shape. When a player spins a shape, they cover it with their piece. As play continues, if they spin the same shape again they can put a second marker on the same shape and freeze the spot. (Sort of like ‘kinging’ in checkers). However, if the other player spins the same shape while there is only one marker on the shape, he can bump the other player off and take his place. Play ends when all the shapes have been frozen. The winner is the one with the most frozen spots. 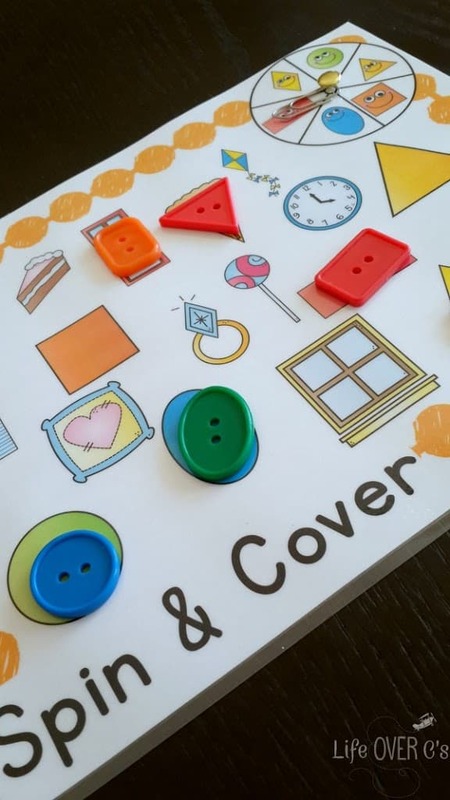 We just happened to have some shape buttons, so we used those for our markers. Unfortunately, our buttons did not have a rhombus shape, so we substituted flowers and hearts instead. We didn’t get around to playing the last game today, but that’s okay because it is really geared towards preschoolers and toddlers. 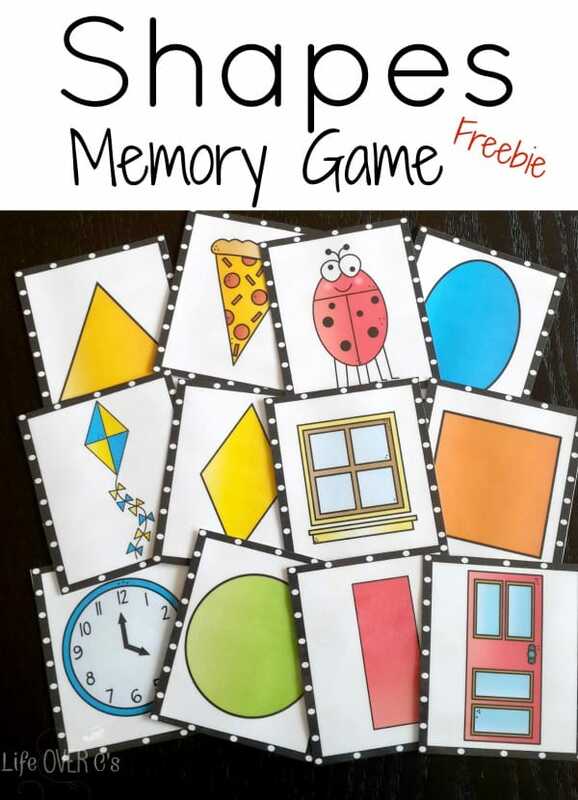 A small memory game is included for practice with basic shapes and their names. 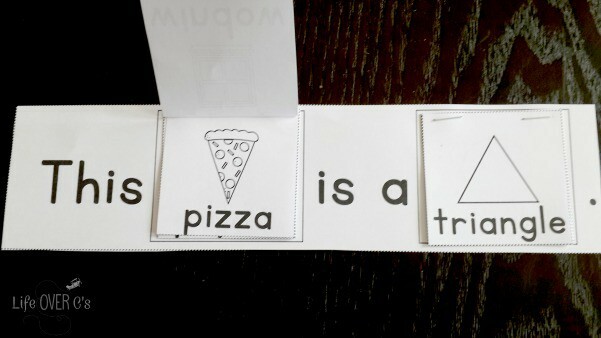 These cards are purposefully oversized, so that they are easy for small children to manipulate and identify the shapes. I printed them on the white side of scrapbook paper, so that they are not see-through. Card stock would also work. Regular colored printer paper would not work as you can see the print through the backs very easily once they have been laminated. 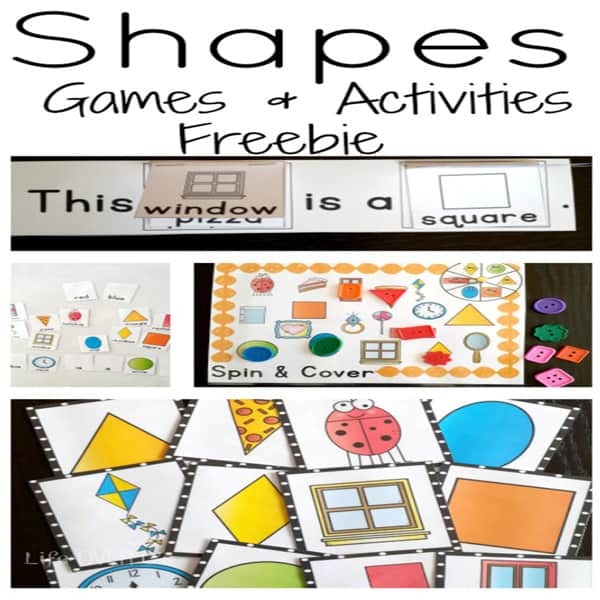 I hope that you and your students will enjoy this fun set of activities for learning shapes. I love this! 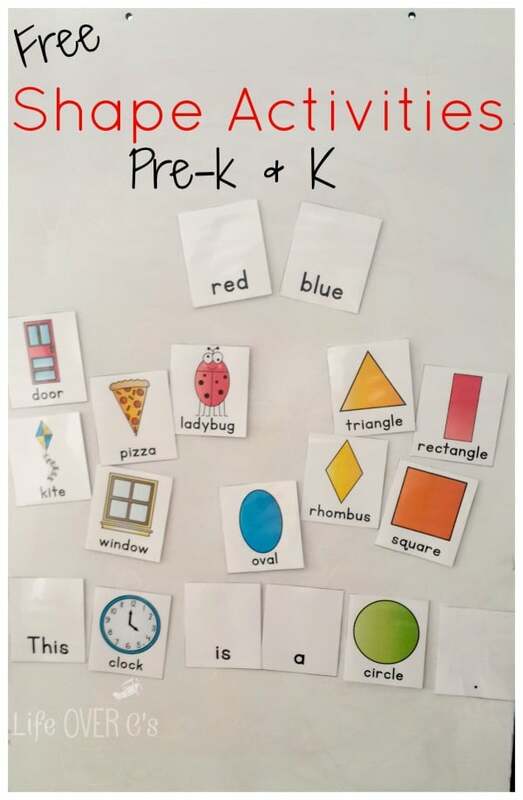 we have been working on shapes and colors and this would be be nice to add in! thanks! I have tried a couple of times to open up this shape unit, hoping to use it with my kinders, but every time I click on the link it takes me to a blank page. Just wondering if you had another link I could try! Thanks for these ideas, they are great! Ohhh! I love this! Thanks for the freebie, I’ll definitely be sharing it on my site. Thanks again.